You may think of bright red spheres when you hear the word "radish." However, you also can find a type of radish that is long, white and slender -- similar in appearance to a small white carrot, sometimes called icicle radishes. The taste is distinctively sharp, spicy and crisp, and it contains fiber, vitamins and minerals your body needs. A half-cup of sliced white icicle radishes contains about 7 calories, with only about 0.05 grams of total fat and virtually no cholesterol, according to nutritional data on the SkipThePie website. The radishes also contain about 8 milligrams of sodium. Your body needs some sodium for proper nerve, bloodstream and muscle function. However, many people consume far more than the recommended maximum 2,300 milligrams of sodium per day. 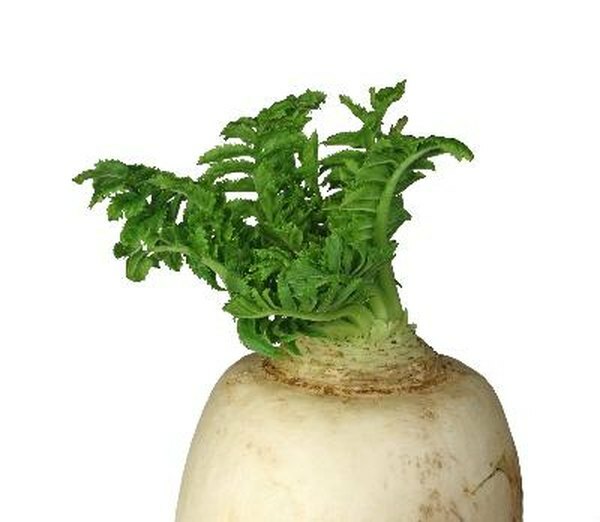 The half-cup of white radishes contains about 1.3 grams of total carbohydrates, with about 0.7 grams of dietary fiber. Fiber is important to help keep your body's digestive system functioning smoothly. The radishes also contain a bout 0.55 grams of protein, which your body uses to repair itself after exercise or injury. There are about 14.5 milligrams of vitamin C in a half-cup of white radishes. Your body needs vitamin C for several reasons, such as the creation of collagen. Collagen is a major component of skin, ligaments, blood vessels and other parts of your body. Vitamin C also helps fight free radicals, which can contribute to such health conditions as heart attacks and cancer. The radishes also contain about 7 micrograms of vitamin B9, or folate, which helps your body create energy from your food and contributes to proper nervous system function. There are about 140 milligrams of potassium in the radishes. They also contain about 14 milligrams each of phosphorus and calcium, as well as 4 milligrams of magnesium. These minerals help maintain a healthy body by keeping your muscles and organs working correctly and your bones and teeth strong.